AUPPL: What's the biggest thing you can attribute to UGA's rise in baseball power in the 2000s? Dawgsports: Georgia has always had a solid tradition in baseball, which is the Red and Black’s oldest varsity sport. The success of Bulldog football is in many ways an outgrowth of the school’s commitment to excellence on the diamond, as Steadman Sanford hired Alex Cunningham away from Gordon because of his skills as a baseball coach. Cunningham, who also coached football in Athens, brought Bob McWhorter with him from Macon, and the rest, as they say, is history. 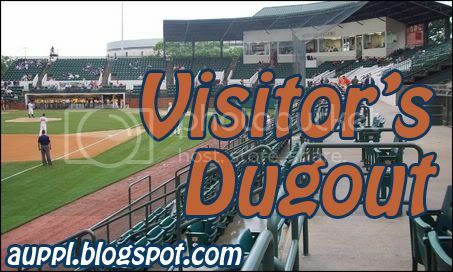 With the Atlanta Braves playing about an hour away from Foley Field, it is hard to generate current fan interest in the Diamond Dogs, but a small yet loyal contingent of the Georgia faithful shows up to see what most often is a talented team. Every Georgia recruiting class since 1999 has played on at least one College World Series team and the Classic City Canines led the nation with eleven athletes drafted in 2009. The other secret to the Diamond Dogs’ success is David Perno. During his playing days in Athens, Coach Perno helped make Georgia one of only two SEC schools to win a national championship in baseball. As a player, assistant coach, or head coach, David Perno has been a part of five of Georgia’s six College World Series teams and he has guided his alma mater to three conference crowns this decade, tied for best in the league. In short, a good coach with good players has produced a good program. AUPPL: How have the losses of Veazey and Farmer impacted the team? Dawgsports: It’s hard to say with Chance Veazey. His injury was more serious, occurred during the offseason, and reminded us all that baseball is, after all, just a game. The fan base has rallied around Veazey through the “Prayers for Chance” fund, and I suspect he has served as an inspiration to the team, as well. Kyle Farmer’s loss has been more immediately felt because it occurred after the start of the season. All four members of the Diamond Dogs’ projected infield have yet to start a game together this season, requiring that players be moved around and probably affecting the team’s ability to find a rhythm. That said, Robert Shipman (who broke into the starting lineup following Chase Davidson’s injury) has put up numbers comparable to or better than Farmer’s, so it is open to debate how large an impact the injury has had on the squad. AUPPL: What were/are the expectations for the Dawgs going into the year? Dawgsports: In the David Perno era, Georgia baseball seasons have tended to be like “Star Trek” movies starring William Shatner: the odd-numbered ones are bad and the even-numbered ones are good. After a young Red and Black team stumbled down the stretch in 2009, a better year was anticipated in 2010. It was expected that the hitting would take a while to come around, but Bulldog fans figured we could count on our experienced pitching staff to keep scores low and the team in games until the offense came together. Needless to say, it hasn’t worked out that way. AUPPL: What would you say are the biggest strengths of the team this year? Dawgsports: Oddly enough, the youth of this club, which has been cited as the source of so many problems, actually may be its greatest asset. Yes, inexperience has caused some miscues, but the Diamond Dogs are 0-4 this season when playing errorless baseball in the field, yet they are 7-1 in 2010 when committing one error. Like penalty flags in football, errors aren’t necessarily as harmful as they appear. Youth may be wasted on the young, but limitless potential is an important asset. Sophomore Zach Cone, who has started every game, is hitting .382 with 16 RBI and four triples. Sophomore Christian Glisson’s .396 average leads the team among everyday players. Freshman Robert Shipman is batting a torrid .444, boasts an .815 slugging percentage, and has belted three home runs. The biggest weakness has been what we all thought would be a strength: starting pitching. Michael Palazzone has the Georgia staff’s best record and most innings to his credit, but even he has a 7.85 ERA and is allowing opposing batters to hit .346 against him. Jeff Walters has yet to card a win, has an 8.83 ERA, and has surrendered a .372 average to the other side. While the bullpen has performed admirably more often than not, the Diamond Dogs are short on quality starts this year. AUPPL: For any Auburn fans making the trip, what are some things that are must dos around the Ballpark? Dawgsports: Foley Field is tucked away behind Butts-Mehre Heritage Hall and just down the street from Stegeman Coliseum. Because of the close connection between the two schools, first-time visitors from Auburn will want to check out the athletic complex surrounding the Bulldogs’ baseball stadium, which features a number of buildings built by former athletic directors Joel Eaves and Vince Dooley, both of whom came to Georgia from Auburn. As for Foley Field itself, be sure to see the statue of Frank Foley at the corner of Pinecrest and Rutherford before entering the stadium and check out Kudzu Hill in the outfield. At least during the postseason, Kudzu Hill is to Foley Field what the railroad tracks were to Sanford Stadium before the east end zone was enclosed in 1981. AUPPL: Should I draft Gordon Beckham on my fantasy team? Dawgsports: Absolutely! Gordo is the real deal and one of the proudest products of the Georgia program in recent years. If you can stomach rooting for a former player from a rival team, he’ll give you the numbers you need for your fantasy team. So there you go. Should be a great series to open SEC play.